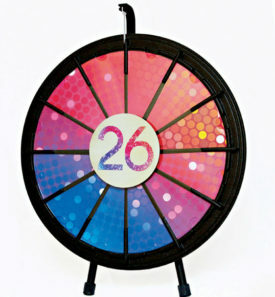 Our most popular interactive game is the prize wheel. With it, you can attract a crowd at a tradeshow, inject fun and excitement into company events and promotions of all kinds, trivia games, parties, fundraisers, sporting events, school or art fairs, and more! Get more attention with full color graphics. 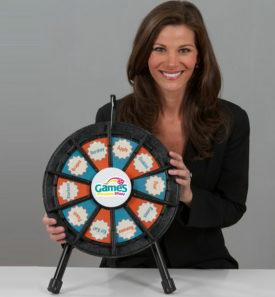 Our games are sold blank, but become infinitely customizable with removable prize pieces, center plates, and headers. Ask about how we can make full color, laminated, die cut graphics for your game. PMS matching available. Do-it-Yourself templates are available under the Graphics tab up top. 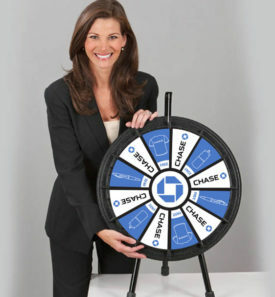 Take the prize wheel on the road. 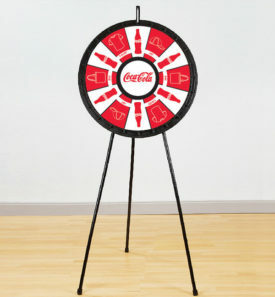 The prize wheel is portable and lightweight. Custom designed travel cases (sold separately) are available for all 31” Classic Wheels and the Mini Wheel. 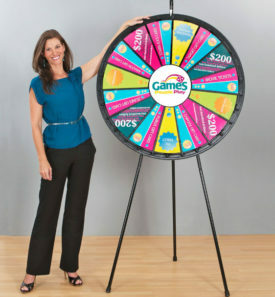 Prize Wheels require no assembly (except the Big Wheel and Promo Wheel).